Ribs need special attention to cook up tender, juicy, and falling off the bone. First give yours a strong spice rub for flavor, followed by a steamy bake for tenderness, and then a quick turn on the grill or in a high oven for a crisp edge and some smoke. Because undercooked ribs are so awful, steaming a little longer can never hurt. Combine the paprika, chiles, cumin, and salt in a small bowl. Pat the spice mixture all over the ribs. Place in a pan, cover with plastic wrap, and refrigerate for at least 2 hours or overnight. Place the ribs in a single layer in a baking pan and pour in water to a depth of about 3⁄4 inch. Bake, uncovered, for 45 minutes. Cover with foil and return to the oven for an additional 30 minutes. Turn up the oven heat to 450 degrees F or heat the grill to medium-high. If finishing the ribs in the oven, brush generously with the Adobado and bake for another 10 minutes per side, basting every 5 minutes. 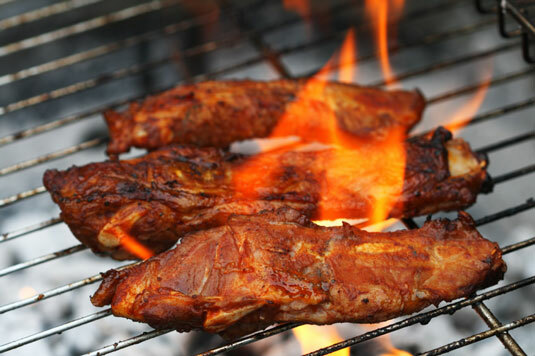 To grill, generously glaze the ribs and grill for 5 minutes per side, frequently brushing with additional Adobado sauce. Cut the ribs apart and serve hot. Inexpensive country-style ribs, available at the supermarket, are a meaty, tasty alternative to baby back ribs. After applying the spice rub, steam in a sealed heavy-duty plastic bag in the top of a double boiler over simmering water for 45 minutes. Then finish in a hot oven. Adobado is a very traditional, sweet, tart Mexican barbecue sauce. It’s great to have on hand for heating up with leftover bits of chicken, pork, or lamb and for serving on rolls for delicious barbecue sandwiches. Briefly toast the chiles directly over a medium gas flame or in a cast-iron skillet until soft and brown, turning frequently to avoid scorching. Transfer the toasted chiles to a saucepan and add the vinegar and water. Bring to a boil, reduce to a simmer, and cook for 10 minutes to soften. Transfer the chiles and liquid to a blender or food processor. Puree until a smooth paste the consistency of barbecue sauce or ketchup is formed, adding 1 or 2 tablespoons of water if necessary to thin. Set aside. Heat the olive oil in a medium saucepan over medium-high heat. Sauté the onion until golden brown, about 10 minutes. Stir in the garlic and cook briefly just to release the aroma. Then stir in the cumin and cook for another minute. Add the chicken stock and reserved chile paste. Bring to a boil, reduce to a simmer, and cook for 20 minutes. Meanwhile, mix together the brown sugar, orange juice, lemon juice, tomato paste, salt, and pepper to form a paste. Add to the simmering stock mixture and cook for 15 minutes longer. You can store Adobado in the refrigerator for 1 week or frozen indefinitely.